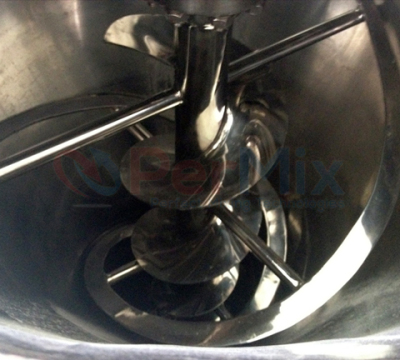 The PerMix PVR series Vertical Ribbon Mixer has a similar appearance with the PRB series Ribbon Blender, but stands vertically same as our PNA series Conical Screw Mixer. PVR is an efficient and versatile blending machine for batch mixing of free-flowing powders. PVR series Vertical Ribbon Mixers are able to give perfect result of mixing due to the innovative design of an outer spiral type mixing element with an inner screw, rotating together in a conical shape trough allowing a complete discharge of all the mixed material without any residue. 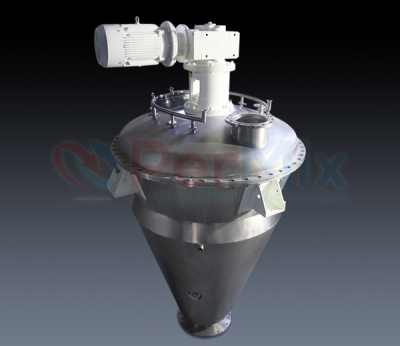 The construction of PerMix PVR series Vertical Ribbon Mixer is very compact: it consists of a cone vessel with the drive unit on the top and discharge valve at the bottom. In the cone vessel, there are a central tapered ribbon with very small clearance between its edge and the wall, and additionally a screw mounted on the central shaft. The ribbon and the screw move the materials upward from the bottom to the top, where the materials then drop by gravity into the center. During this continuous operation, material particles and heat are exchanged quickly which leads to a homogeneous product. 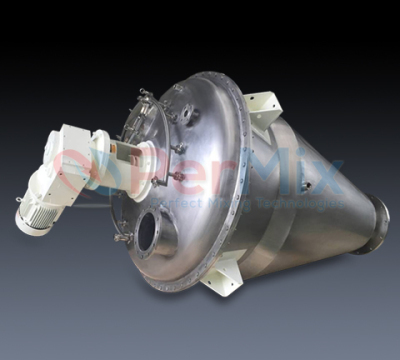 Besides, the material particles are mixed with minimal mechanical and thermal stress, which makes this type of mixer a good solution for fragile and heat sensitive product. We offer several types of spiral ribbon for different sizes and applications. 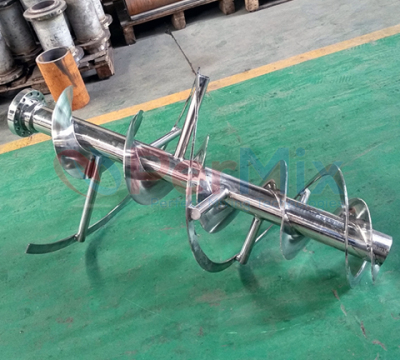 We are able to offer our PVR Mixers with contact part to be built in Carbon steel, SS304, SS316/316L, Titanium, Duplex stainless steel, Hastelloy, etc. Finish of internal and external finish can be dull polished, 180 grit polished (food grade), or mirror polished. For abrasive materials we offer hardened steel as the contact part. The PVR mixer can be designed for vacuum drying & deaerating or for inner pressure working for special applications.